The last anybody expected was a comedy routine. Retirement announcements are usually the Wet n Wild of rugby league. Waterworks guaranteed. Many of us are still haunted by Allan Langer's announcement. The funniest man in rugby league could hardly get the words out as he sniffled and paused and wept. Langer was being led to an execution. Nobody was comfortable with the way he was leaving the game. Andrew Johns choked up. Billy Slater shed several tears last year. Johnathan Thurston showed what everybody knew, that he was emotionally sensitive and that he was surprised by how quickly retirement was upon him. Thurston cried and many around cried with him. "The hardest part of a footballer's life is they get to that time and realise the time is up," coach Wayne Bennett said. Shock retirements too often mask a cry for help. They reveal a man yet to emotionally deal with what he was saying. For one, Inglis looked better than he did even a week ago. There was no heaviness in the eyes. His skin wasn't grey. His look was that of a man at peace. Inglis quickly showed what state of mind he was in. Just as the announcement got going he chipped Bennett for keeping him waiting. There were no tears, no awkward pauses or rushing sentiment. 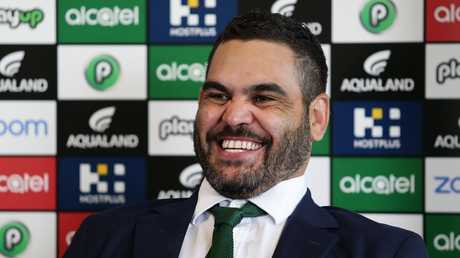 Inglis was all smiles at his press conference. Picture by Brett Costello. It was bad management if they wanted him to play on. At home in Kempsey, Inglis found perspective. He told his nan, Val, that he was retiring. "My nan turned around, started laughing after she shed a tear, and said 'you were going to have to give it up some day'." Yes, life was going to be all right. He saw his father Wade. "I didn't know what to do," he said, "so I punched him in the chest and started crying." That was it, though. Tears over, a burden gone. The Rabbitohs' are determined to employ him at Souths Cares and educate him for the future. 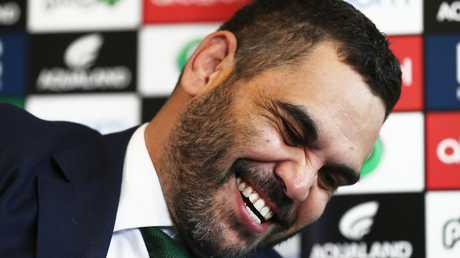 Inglis was in good spirits at the press conference. Picture by Brett Costello. 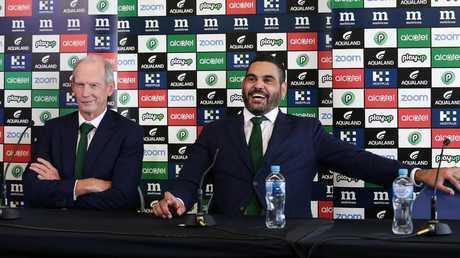 Football general manager Shane Richardson joked Inglis was going to have four weeks off, two weeks off … actually a week off before taking the job. The morning was carried in good humour, the undertone being his frank admission he could no longer be the player he once was. "I can't be the leader that I used to be and have the presence I used to have," he said, before turning the gun sights on teammate John Sutton. No time for melancholy. "John Sutton's turning 40 and he still has that presence," he said. "He has just not given up. I've had a tremendous career. I'm surprised Cameron Smith is still going round, if John Sutton is 40, he must be 50." 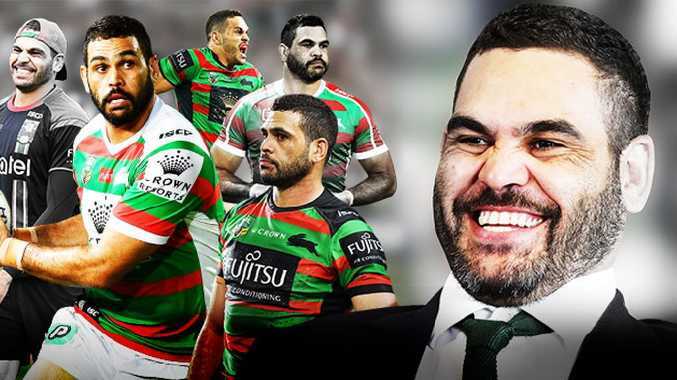 Inglis leaves behind an incredible legacy. Photo by Matt King/Getty Images. Inglis was asked about the decision to play for Queensland ahead of NSW. He admitted, perhaps for the first time, that it was simply a matter of ticking a box and he chose Queensland even though they were coming off three straight series losses, and even if it all worked out for the better. 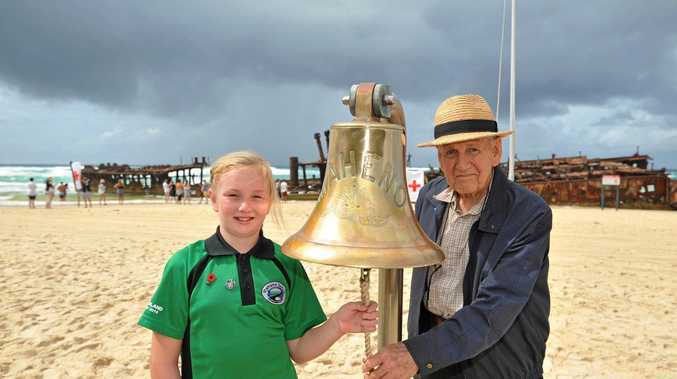 "I felt more at home there, since I left Kempsey … which is just on the other side of Coolangatta," he said. He was comfortable and light and a little mischievous. His mum Monica had a small cry in the corner but that was all for tears. He was some athlete, everybody knows that. Over his career he got offers to play NFL, French rugby, English Super League. "It's too cold in the UK for me," he said. The strongest offer was to switch to Essendon in the AFL. James Hird needed just one look to know Inglis had it and the Bombers called in the wake of the Storm's salary cap scandal. Melbourne needed to shed players. Inglis shook his head at the thought of it, a cold shiver running up his spine. "Oh mate, if I went from the Melbourne Storm cap saga to the Essendon drug saga I wouldn't be here today, so imagine that! I'm glad I didn't do that." We would have missed so much if the Bombers had succeeded. Thank heavens for Souths, who got him at the last hour. Instead he carved one of the great careers, one that closed with a handshake with the coach he said he always wanted to play for but, in the end, played just two games together. "Make sure you get this handshake," he said, grabbing Bennett's hand. "All right, so I can go play some golf! Anyway, got a week of it."